It wasn’t easy or pretty, but by the time Wednesday’s closing bell rang, most stocks were back in the black … barely. Another wave of bullishness from Advanced Micro Devices (NASDAQ:AMD) likely got the S&P 500 over the hump, with a helping hand from Altria Group (NYSE:MO). Shares of the cigarette maker gained nearly 7% in response to news that the FDA was mulling taking on oversight of e-cigarettes, which could rekindle demand more traditional forms of smoking. Holding the market back was the 4.3% slide from Micron Technology (NASDAQ:MU) and a 7% setback for Snap (NYSE:SNAP). The memory maker was down following a downgrade from Goldman Sachs, and the parent company of Snapchat stumbled after BTIG Research suggested the stock could lose another 50% of its value over the course of the next twelve months. The wild backdrop doesn’t make things easy for traders as Thursday’s action begins. The top trading prospects for today are Twitter (NYSE:TWTR), Danaher (NYSE:DHR) and Northern Trust (NASDAQ:NTRS). Here’s a detailed look at stock charts of all three and what makes each one noteworthy. Late last week, Twitter was put back into focus after the stock not only broke below its 200-day moving average line — drawn in white on both stocks charts — but also fell to a lower low under the August low. For the next few trading days, it looked as if the bulls might try and stage a recovery effort. With today’s 3.7% tumble, though, the downtrend is fully renewed. • The floor in question was $31.25, marked with a yellow dashed line on the daily chart. 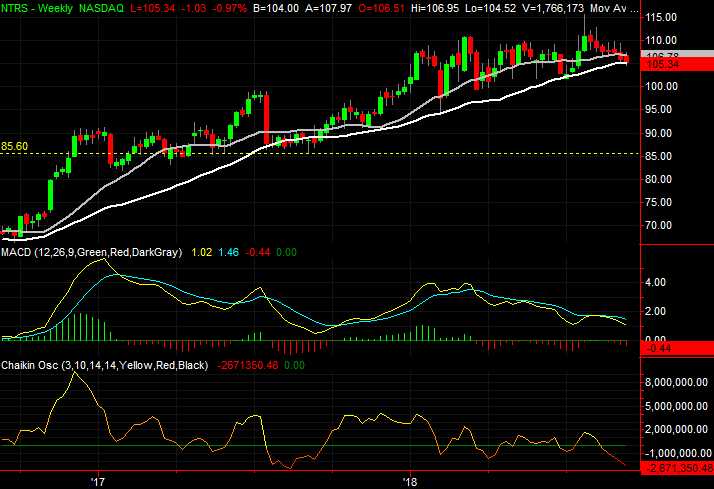 The weekly chart of Twitter had already indicated breaks under its best bets for support. • Notice how the selling volume perked up again, following two low-volume “up” days that never got any real traction. • This may only be a referendum on social media stocks in general, but the cause is irrelevant. What matters for the time being is momentum, and it’s all bearish in that light. For months Danaher shares were trapped between support and resistance, getting squeezed to a point where there was no more room to roam. Either the bulls or the bears were going to have to make a decision and stick with it. It looks like the bulls won the standoff for this scientific instruments maker, setting the stage for upside. • The ceiling was $104.30, plotted with a red dashed line on both stock charts. Rally efforts had been stymied there several times since January, but DHR finally punched through last week. • This rally may last longer than it feels like it should. Danaher shares consolidated for months, but rallied for several months late last year. The valuation isn’t “cheap,” but it never has been. 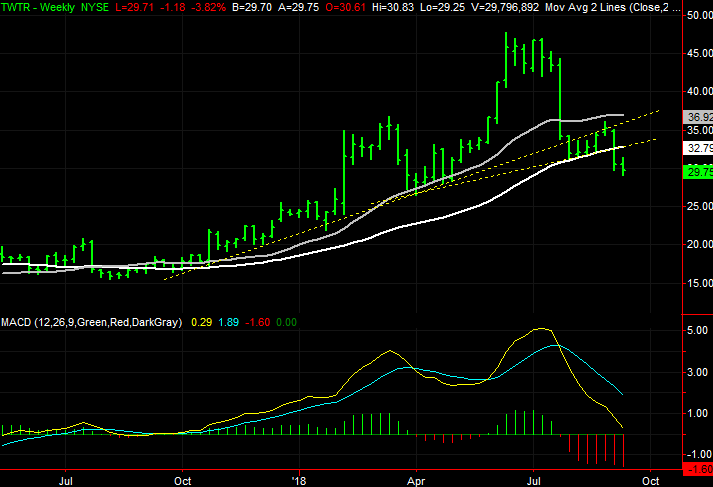 • The peak — at least a temporary one — may be best spotted on the weekly chart. Notice how a wide divergence between the gray 100-day moving average line and the white 200-day moving average tends to materialize right as the stock starts to revert to its mean… the 200-day moving average. Last but not least, asset management firm Northern Trust is doing well enough, and the stock doesn’t appear to be in too much trouble. When one takes a step back and looks at the bigger picture though, it becomes clear that NTRS is one bad day away from falling off the edge of a cliff. 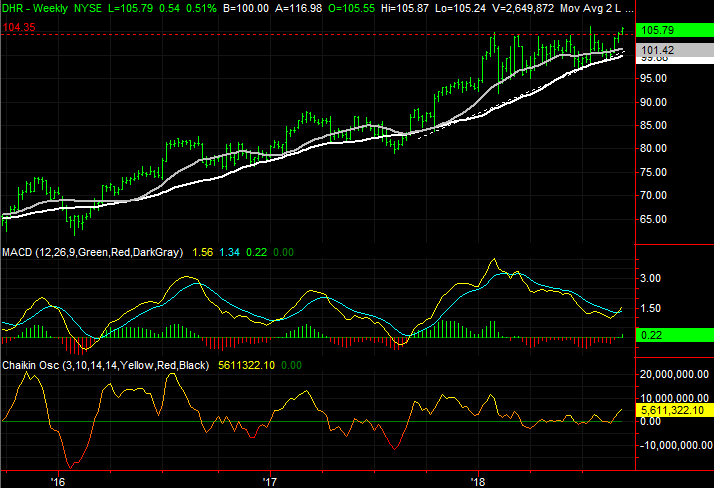 • The make-or-break line in the sand is the 200-day moving average line, plotted in white on both stock charts. Shares tested that line as a floor in February and again in July, and tested it once again on Wednesday. Sooner or later, continued tests will crack the floor. • Working against a rebound, and in favor of a breakdown, is the fact that the overall selling volume continues to grow. • Though it’s an extreme possibility, should any selloff gain momentum, there’s no clear technical support for Northern Trust shares until 2017’s primary floor around $85.60 is revisited. The post 3 Big Stock Charts for Thursday: Twitter, Danaher and Northern Trust appeared first on InvestorPlace.